The genus name, Achillea derives from Greek mythology. Achilles, hero of Homer’s “Iliad,” had been a student of Chiron, the centaur renowned for his knowledge of medicinal herbs. Yarrow plants were highly regarded at the time for their medicinal properties. Yarrow plants were widely used prior to modern times to staunch blood. Achilles, no doubt, didn’t forget the lessons he learned from Chiron. In leading the Greeks against Troy in the bloody Trojan War, Achilles and his men would have had frequent occasion to use yarrow plants to treat their wounds. The association between Achilles and this miraculous herb stuck. But Greek mythology was rarely satisfied by such associations and preferred to tell a tale, instead. So according to legend, yarrow plants owe their very origin to Achilles: they were supposed to have sprung from some metal scrapings off the great warrior’s spear! Meanwhile, the species name, millefolium (thus the common name, “milfoil”) means thousand-leafed and derives from yarrow plants’ deeply toothed, fern-like foliage. Its specific name, millefolium, is derived from the many segments of its foliage, hence also its popular name, Milfoil and Thousand Weed. Another popular name for it is Nosebleed, from its property of stanching bleeding of the nose, though another reason given for this name is that the leaf, being rolled up and applied to the nostrils, causes a bleeding from the nose, more or less copious, which will thus afford relief to headache. Parkinson tells us that ‘if it be put into the nose, assuredly it will stay the bleeding of it’ — so it seems to act either way. Aside from the myth of Achilles, yarrow has been mentioned in the mythos and folklore of many other cultures. The origin of Yarrow comes from the Saxon and Dutch words ‘Gearwe’ and ‘Yerw’ respectively. Yarrow is a plant that has been historically used world wide, from China to Europe to North America, both medicinally and magically. It has been used as snuff, in salads and in the manufacture of beer and to flavor liquor. Yarrow has been employed in love charms, and in divination practices (the traditional way to cast the I Ching is with the stalks of yarrow). Several Native American tribes had numerous uses for the herb, such as a tea to cure stomach ailments, a poultice on infected wounds, and as a mosquito repellant, and it has been suggested that yarrow might be one of the 9 sacred herbs of the Saxons. One of the plant’s constituents, achilleine, was even been used as a quinine substitute. It was used in counter-magical practices to ‘drive out the devil’ of those who had become possessed. However, to be effective, the holy mass had to be recited over the herb 7 times and it also had to be drunk from an upside down church bell (!). The French name for this herb ‘herbe de St. Joseph’ is derived from a legend according to which Joseph one day hurt himself while working on his carpentry. The infant Jesus brought him some Yarrow, which instantly staunched the bleeding and healed his wounds. Yarrow is indeed excellent for this purpose. Common Yarrow is an erect herbaceous perennial plant that produces one to several stems (0.2 to 1m tall) and has a rhizomatous growth form. Leaves are evenly distributed along the stem, with the leaves near the middle and bottom of the stem being the largest. The leaves have varying degrees of hairiness (pubescence). The leaves are 5-20 cm long, bipinnate or tripinnate, almost feathery, and arranged spirally on the stems. The leaves are cauline and more or less clasping. The inflorescence has 4 to 9 phyllaries and contains ray and disk flowers which are white to pink. There are generally 3 to 8 ray flowers that are ovate to round. Disk flowers range from 15 to 40. The inflorescence is produced in a flat-topped cluster. Yarrow grows up to 3500m above sea level. The plant commonly flowers from May through June, and is a frequent component in butterfly gardens. Common yarrow is frequently found in the mildly disturbed soil of grasslands and open forests. Active growth occurs in the spring. Yarrow prefers a sunny locale with light soil and good drainage. It does very well in nutrient poor soil, and grows best in zones 3-8 and is drought tolerant once established. To plant, you may propagate from seed, root division, or cuttings taken. Place the plants 1-2 feet apart. Some varieties may need to be staked and plants will need to be thinned over time. Yarrow is a deer-resistant perennial and can assist in deer control. Yarrow is considered an especially useful companion plant, not only repelling some bad insects while attracting good, predatory ones, but also improving soil quality. It attracts predatory wasps, which drink the nectar and then use insect pests as food for their larvae. Similarly, it attracts ladybugs and hoverflies. Its leaves are thought to be good fertilizer, and a beneficial addative for compost. Yarrow is a wild edible; it can be harvested in the wild, and does not need to be grown in the garden. If using for food, yarrow leaves are best in early spring when they are still soft and tender. Their fernlike appearance is easy to identify even long before the flowers develop. Once they get older they tend to get a little tough and prickly and the taste is nowhere near as good. If harvesting for other purposes, the leaves and stems can be collected any time during the growing season. Flowers however, should be collected during the flowering period, between June and September as soon after blooming as possible, but before the flowers begin to be sun bleached. To dry for use or storage, yarrow flowers can be hung upside down in a well ventilated room, out of sunlight—particularly if you want to keep the blooms whole for use in flower arrangements (the paper bag method described for chamomile is good for this). If drying the whole plant, crumble and discard large stems (or use them for I Ching divination) and store. Yarrow is known for its choleretic, antibacterial, astringent, and antispasmodic, diaphoretic, antipyretic, hypotensive, properties, as well as being a digestive stimulant and menstrual regulator. It is best used for its tonic and alterative properties that are both capable of improving the overall function of all the main bodily systems and treating several acute problems. Yarrow has long been known for its ability to stop or slow bleeding. As an excellent anti-inflammatory and soothing relaxant, it is useful to relieve cramps, particularly menstrual cramps and stomach cramps and is known for its ability to both bring on delayed periods, and reduce excessive menstrual bleeding. Yarrow also provides support for the digestive and urinary due to its diuretic, tonic and anti-inflammatory properties. It is also thought to improve circulation and decrease high blood pressure. Additionally, yarrow has often been used to reduce fevers. *to aid digestion, and cold relief, try this tea… Take 1 sprig of mint, 3 yarrow leaves, 1 head of Elder Flowers & 1 small bunch of Parsley and place in a small tea-pot, pouring 1 Cup of boiling water over, and steep for 10-15 minutes. Up to 0.5% volatile oil (containing up to 51% of the blue oil azulene*, borneol, terpineol, isoartemisia ketone, cineol, eugenol, thujone, pinene, camphor, achillin, sabinene), lactones, cyanogenic glycosides, aconitic and isovalerianic acid, salicylic acid, asparagin, triterpenes, sterols, flavonoids (apigenin, rutin, luteolin, quercetin, kaempferol), bitters (including ivain), tannins, hydroxycoumarins, saponins, sugars, cyanidin, amino acids, fatty acids, glycoalkaloid (achilleine), resins, fluorescent substance. Azulene, a component of yarrow essential oil develops during the distillation process and is not present in this form in the actual herb. It gives the blueish color to the essential oil (also to German Chamomile essential oi) and is a key provider of the anti-inflammatory properties of the essential oil. Adjust the recommended adult dose to account for the child’s weight. Most herbal dosages for adults are calculated on the basis of a 150 lb (70 kg) adult. Therefore, if the child weighs 50 lb (20 to 25 kg), the appropriate dose of yarrow for this child would be 1/3 of the adult dosage. Persons allergic to plants such as feverfew, chamomile, chrysanthemums, ragweed, and Echinacea may suffer an allergic reaction when they come into contact. Pregnant women should avoid its use because yarrow may cause uterine bleeding or a possible miscarriage. The German Commission E does not recommend yarrow use in breastfeeding women. Prolonged yarrow use may cause photosensitivity and may be hard on the liver. Yarrow is a well-known protection and purification herb. Carried in the hand it is believed to ward off fear. Try carrying in a silk or velvet bag when going to a job interview or making a speech to reduce anxiety. Carried in a pocket or purse, Yarrow reverses negativity and protects from hexes. Add to the bath to protect from evil or harm. Throw Yarrow flowers across the threshold to protect the house from evil. Tie to an infant’s cradle for protection from harmful forces. Yarrow was strewn across the threshold of a house to keep out evil influences and was worn to guard against evil spells. Country people tied sprigs of it to a baby’s cradle to protect the infant from witches who might try to steal away its soul, which they believed to be a real possibility in cases where there had been a delay in baptizing the infant. *Yarrow can exorcise evil and negativity from a person, place or thing. *A bunch of dried yarrow hung over the bed or yarrow used in wedding decorations will ensure a love lasting at least seven years. *Cut yarrow before sunrise, place it under the pillow at night and hope to dream of one’s sweetheart. If their back is turned towards the dreamer, the relationship will not last, but if they are facing the dreamer, marriage will soon follow. The first users of the I Ching consulted by sorting yarrow stalks – the yarrow being a sacred plant imbued with spiritual power, and thus naturally right for seeking the truth. Later, as the I Ching became more popular and widely used, a simpler method was invented using three coins. Exactly when it was invented is not known, but it became popular during the twelfth to thirteenth centuries AD. The original yarrow method has been lost, but it was reconstructed, at about the same time as the coin method was gaining in popularity, by Chu Hsi. In many I Ching books, you will find the yarrow method referred to as the ‘authentic’, original way to consult the I Ching. While its roots do go back further – to long before the invention of coinage in China – we have no way of knowing whether the method we use now is the original. 1 – Take a single stalk from the bundle of 50 and lay it crossways in front of you. This symbolizes the Wu Chi – the unchanging ground of being. 2 – Divide the remaining stalks into two piles. Set down the pile in your right hand. 4 – Count off the left pile by fours, setting the fours in a pile separate from the right-hand pile. When you have 4 or fewer left from the original left pile, tuck them between the 3rd and 4th fingers of your left hand. 5 – Now put the right-hand pile into your left hand and also count it off by fours until four or fewer sticks remain. 6 – If you counted correctly (ie. got fours not threes or fives each time you removed stalks) you now have a total either 5 or 9 sticks in your left hand. Think of 5 as a small number, equivalent to heads or yang in the coin method, and think of 9 as a large number, equivalent to tails or yin in the coin method. 7 – Lay these 5 or 9 stalks across the one you removed in step #1. 8 – Repeat steps 2 through 7 twice more. You will get either 4 or 8 stalks each time (not 5 or 9 as in the first time).Here 4 is small, yang or heads; 8 is big, yin or tails. This is the first (bottom) of the six lines in your hexagram – remember it or write it down. 10 – Pick up all the stalks except the single one from step #1, then repeat steps 2 through 9 five more times. The whole process takes about 10-15 minutes — much longer than the six quick tosses of three coins in the coin method. While it may feel awkward at first to use the yarrow stalks, with practice it becomes a nice “hand-dance meditation”. *Yarrow tea can be used to water ailing plants. 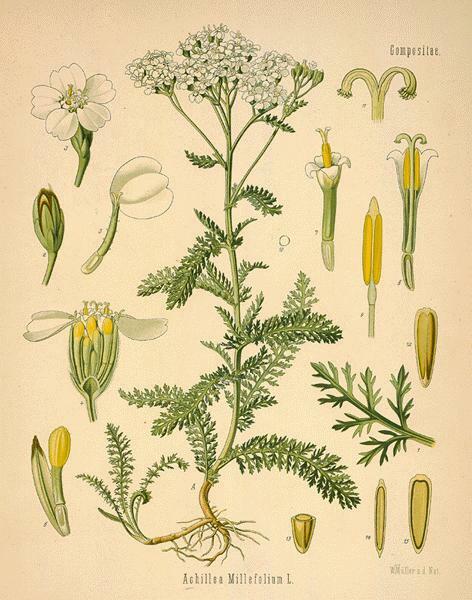 *Yarrow can be used in water, vinegar, ammonia, or alcohol extraction for surface cleaning as a mild disinfectant. *Essential oil, particularly in combination with geranium and catnip, is a good insect repellant for moths, roaches, and mosquitoes. Combine all ingredients. il water, pour one cup over one tsp of herbs and steep15 minutes. Strain and serve hot with honey and lemon, if desired. Infuse Yarrow and Rose oil. Combine with beeswax to desired consistency. Preheat the oven to 450° and light the grill, if you’re using one. In a small bowl, stir together the olive oil and garlic. Cut the pointed ends from the lemons so they will sit flat, then halve them crosswise. Set them flesh side up in a glass or ceramic baking dish and spoon 1 tablespoon of the sugar on each half. Bake for 10 to 15 minutes, or until the sugar is melted and the pulp is soft. Preheat the broiler, if using. Sprinkle the chopped yarrow inside the shrimp and pinch closed. Brush the shrimp with the garlic oil and season with salt and cayenne. Grill or broil the shrimp 2 to 3 minutes per side, or until opaque. Squeeze some of the lemon juice over the shrimp and garnish with the yarrow sprigs. Serve at once with the baked lemons. This recipe for a YPA (Y for yarrow, one of the principal flavors) came to me one summer afternoon after mowing the lawn. Yarrow, thyme, and savory have spilled out of my wife’s herb garden to become part of the lawn in one place, and they inevitably get mowed along with the dandelions and weeds that pass for grass. The aroma is amazing. One day after mowing, as I sat there sipping a very well-made local, commercially brewed pale ale, the aroma of hops, malt, and herbs mingled and I couldn’t get to my notepad fast enough to write down my latest brainstorm. And here it is. • 1 oz. Fuggle hops (4% alpha acid) for 60 min. • 1 oz. Northern Brewer hops (7% alpha acid) for 45 min. Heat 1.25 gal. of water to 165° F, crush your grains, and add them to this water. Hold the mash at 152° F for 75 min. Run off the liquid and sparge with 2 gal. of water at 169° F. To the run-off in the kettle add the dry malt extract, then heat to boiling. Total boil is 60 min. Add the Fuggle hops and boil 15 min. Add the Northern Brewer hops and boil 45 min. more. Turn off the heat and add the yarrow, savory, and thyme (in a bouquet garni or fine mesh bag). Steep 30 min. as the wort begins to cool. Remove the herbs and chill the wort in an ice-water bath. Add to the fermenter after 60 min., along with enough cold, pre-boiled water to make 5.25 gal. At 68° F pitch the yeast culture. Ferment near 65° F for 10 days, then rack to secondary and age an additional 10 to 15 days. Prime with a mixture of corn sugar and brown sugar, bottle, and condition cool (50° F) for three weeks. All-grain brewers: Increase the grain bill to 10 lbs. pale malt, 0.75 lb. crystal, and 0.75 lb. wheat. Use 3.75 gal. of mash water and sparge with 5 gal. of sparge water. Temperature and time are the same, as are the hop schedule and additions, but plan your boil to reduce the volume to 5.25 gal. Chill as quickly as you can after steeping the herbs. All-extract version: Steep the crystal and wheat as above in 2 gal. of water and gradually heat to 170° F, then remove them. Increase dry malt extract to 7 lbs. and add 1 cup light brown sugar to the boil as well. Herbs: The hops used in this recipe are for flavor and bitterness only. Aroma hops, a necessary part of an IPA, are replaced by a selection of very aromatic herbs from the garden, used essentially as dry hops. The combination given here is what I prefer, but of course you may use anything you like. This does have a bit of a medicinal aroma at first, but it mellows after a few weeks in the bottle. If you really want a fresh aroma and zing, use these herbs (or some additional) in the fermenter or secondary. mixed in with the essences. This is often given to Witch couples on the eve of their Handfasting. Rose Geranium: for protection against adversity. seems perfect. Make up two ounces or so. Then add one pinch dried yarrow. 7 years. Seven is the number of Venus, the planet of love. When finished, pour into twin crystal jars. blended together, poured into one of the jars, and the other jar should be hidden in some secret place. Such a beautiful and thorough post. I love all the musings and healings yarrow imparts and have been thinking of writing a post on yarrow once I glimmer more of a personal story for it. love your post!